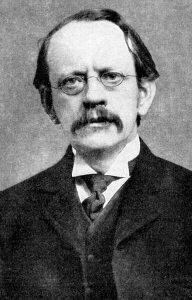 December 18 is J. J. Thomson’s birthday. Thomson was a British physicist who is best known for the discovery of the electron. He was investigating the discharge of gases in a cathode ray tube. He theorized cathode rays were made up of ‘corpuscles’ or particles smaller than atoms. He also theorized these corpuscles were the building blocks of atoms themselves. He managed to build a cathode ray tube that allowed the beam of rays to be bent by both electric and magnetic fields. This led him to the idea cathode rays were made up of negatively charged particles. By measuring the deflection caused by the magnetic and electric fields, he was able to determine a charge to mass ratio of these particles. His initial findings had the mass at less than the mass of a hydrogen atom. Thomson was awarded the 1906 Nobel Prize in Physics for this early work. The term electron would replace corpuscle by other scientists to reflect the electrical nature of the particle. Thomson also proposed an atomic model known as the ‘plum pudding’ model where the atom is made up of electrons scattered throughout a cloud of massless positive charge. In a few years, his student Ernst Rutherford would disprove this model. Thomson’s work with canal rays (the early name for streams of positively charged particles) provided the first evidence of Frederick Soddy‘s isotopes. Thompson’s group passed a stream of ionized neon through strong magnetic and electric fields. These fields would act on the moving charged particles and deflect their path. The amount of deflection is proportional to the ion’s mass. Thomson’s detector film recorded two different bright spots indicating the neon ion stream was made up of particles of two different masses. 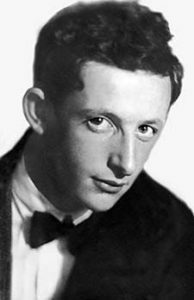 1996 – Yulii Borisovich Khariton died. 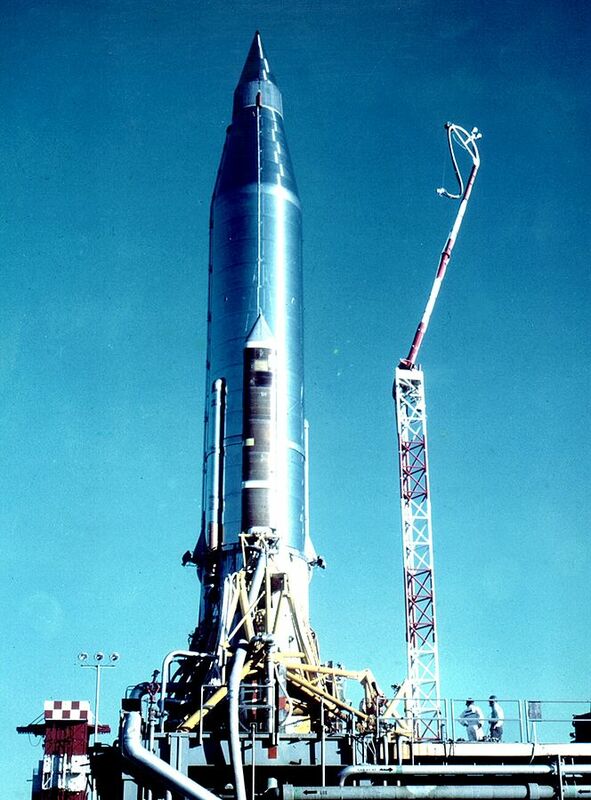 1958 – First communications satellite is launched. 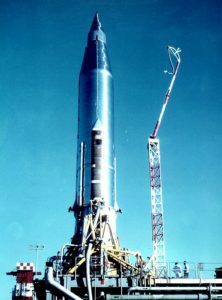 Atlas B rocket with Score payload sitting on the launchpad. This is the President of the United States speaking. Through the marvels of scientific advance, my voice is coming to you from a satellite circling in outer space. My message is a simple one: Through this unique means I convey to you and to all mankind, America’s wish for peace on Earth and goodwill toward men everywhere. This mission was a direct effort to address the Soviet’s launch of the Sputnik satellites. 1939 – Harold E. Varmus was born. Vamus is an American geneticist and cytologist who shares the 1989 Nobel Prize in Medicine with J. Michael Bishop for their discovery of the origin of oncogenes. Oncogenes are genes in a cell that turns normal cells into cancer cells when mutated or expressed in high levels. 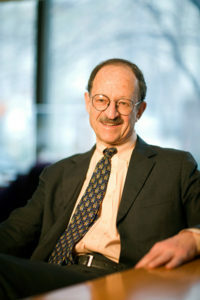 He also served as director of the National Institutes of Health from 1993-1999. 1912 – Daniel Mazia was born. Mazia was an American cell biologist who, together with Katsuma Dan, identified the cell structure responsible for mitosis. Mitosis occurs when a eukaryotic cell divides the chromosomes into two identical daughter cells. 1856 – Joseph John Thomson was born. 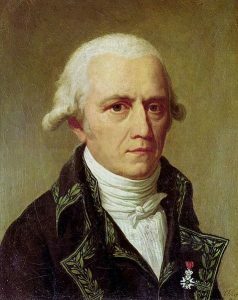 1829 – Jean-Baptiste Lamarck died. Jean Baptiste de Lamarck (1744-1829) French zoologist and first theories of evolution. Jean-Baptiste Pierre Antoine de Monet, Chevalier de la Marck or just Lamarck was a French biologist who presented the first theory of evolution called Lamarckism. Lamarckism was a popular theory of evolution where life was not a fixed event. As an organism gained new characteristics due to changes in the environment and survived the change, it would pass on these characteristics to future generations. Lamarck called this principle soft inheritance. Another aspect of inheritance was the idea of use and disuse. An organism would lose characteristics it didn’t use anymore and develop ones that proved useful and were used more. For example, giraffes stretched their necks to gain access to leaves higher on a tree. Each generation would evolve longer necks to reach leaves at the tops of trees. These changes were thought to be caused by fluids in the body that drove the organism to adapt to its surroundings and evolve. Another principle of Lamarckism was that organisms were driven to become more complex. Lamarck believed life spontaneously generated into simple organisms and evolved into the complex forms we see today. He also felt the simple organisms you see today were new forms of simple, recently generated life. Lamarck’s theories weren’t widely accepted during his lifetime, but they did start the discussion on evolution. Lamarckism fell out of vogue when Darwin came on the scene. Darwin and the later theories of Mendelian genetics have not completely replaced Lamarckism. Some scientists are applying the idea of soft inheritance to single-celled organisms. Scientists have observed single-celled organisms and prions develop new genetic structures apparently as a result of resistance to an environmental influence and then go on to pass that resistance on to future generations.